Planning commission members Mandy Espinoza, left, and Kevin McSherry. 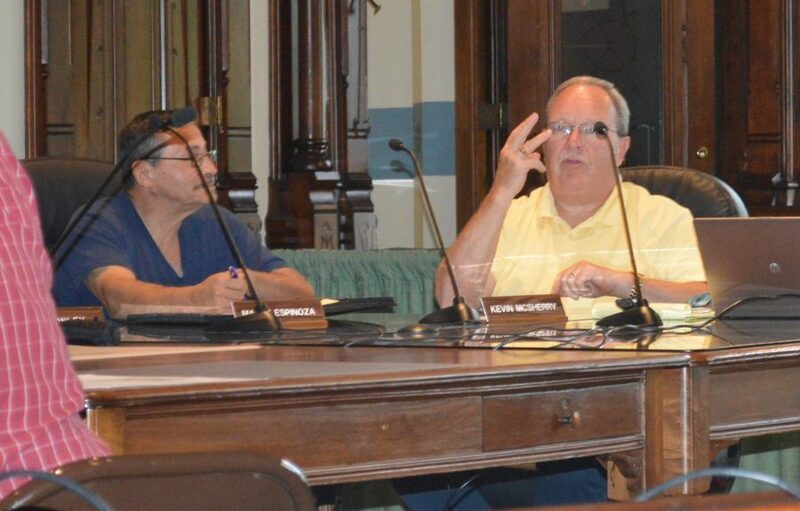 WARSAW — A four-lot residential subdivision is one step closer to reality after being recommended for approval by the Kosciusko County Area Planning Commission during its regular monthly meeting Wednesday afternoon, Aug. 1, in Warsaw. Indiana University Foundation petitioned the planning commission to rezone 5.5 acres it owns from agricultural to residential on the west side of Second Street, north of Armstrong Road in Oswego. It is the old Arnolt property located at Oswego Lake near the Oswego Cemetery. Attorney Steve Snyder, representing the IU Foundation, said the property was received as a gift and the intent is to develop it into four lakefront lots with a surface water retention area. A remonstrator asked if it is possible condos could be put in but Snyder said that is not the plan. County commissioners will consider the petition at their Tuesday, Aug. 21, meeting. In other business, the APC recommended approval for Jeff Strombeck to rezone approximately 17.5 acres from agricultural to commercial on the north side of CR 500N at the intersection with SR 13 in Tippecanoe Township. The acreage to be rezoned is the southern portion of a larger tract of ground. Snyder said the property is pending sale and the county board of zoning appeals has already approved boat storage units to be placed on part of the property. He noted the other three corners at the intersection are zoned commercial and that type of zoning would be a good fit. He admitted curb cuts will be a problem and a cul-de-sac will be used for access to the property. He did not specify how the rest of the property would be developed. County commissioners will consider the petition at their Aug. 21 meeting. Approval was also recommended for Kurt Carlson to rezone property from public use to agricultural on the north side of CR 550S, just east of SR 15 in Clay Township. It is an old church building Carlson used to operate a furniture manufacturing shop for 20 years. He put it up for sale last year and noted a few people have expressed interest in living there, but the zoning would need to be changed first. Dave Munson, a nearby property owner, said he is not against the rezoning but expressed concern if someone moves in they may not like the livestock in the fields around the church. County commissioners will consider the petition at their Aug. 21 meeting. Also on the agenda, Orange Cat LLC petitioned to have 11.64 acres rezoned from public use to residential on the east side of Eastshore Drive, north of Northshore Drive in Turkey Creek Township. It is the southern portion of the former Smith Walbridge Camp. Approval for the petition was recommended by the APC and the site will be used by Fairfield Building Trades to build a house. County commissioners will consider the petition at their Aug. 21 meeting. In other business, approval was recommended for Rose Cotton to rezone 6.13 acres from agricultural to residential on the north side of CR 700S, east of Claypool Elementary School in Clay Township. The number of sell-offs allowed for the property have been exhausted and Cotton wants to sell 2 acres for her daughter to build a house on the back side of the property near a wooded area. Attorney Richard Helm, representing the Linnerts, said they want to remove the “stub” from public domain. There was some discussion about how the vacation could cut off part of a neighbor’s access to his gravel driveway and it was recommended the Linnerts enter an agreement with the neighbor before the Aug. 21 county commissioners meeting when the petition will be considered again.